The Bajra Bhakri is a Indian flat bread, it is tasty and healthy because of its high dietary fiber and other nutrients. 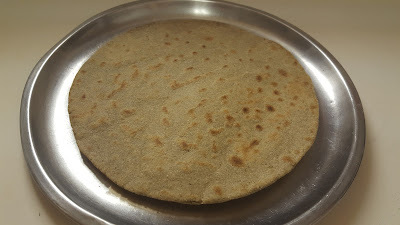 This Bhakri is usually made with one of the millet flour. Bhakri is served with chutney, baingan bharta, all vegetables, thecha ( made from green chillies and peanuts ), pithale. Bhakris are made primarily with hot water, and flour. It needs to add hot water to make the dough which helps in rolling out easily. The Bajra Bhakri is mainly prepared in winter especially near the festival of Sankranti. Our ancestors were experts at making these tasty and healthy dish. Sieve millet flour in a round shaped big bowl. Make a well into the flour and add boiled water. Rest it for about minute. Now knead to make soft dough. Make a small ball from dough and sprinkle some flour on floor or rolling board and make Bhakri by rolling with your palms, make it round shape. Meanwhile heat the frying pan or tava. Place bhakri on tawa (make sure tava should be hot). Be careful while putting the bhakri on tava dusted side should be at upper side. Spread little water on bhakri. Flip it and roast from both sides with the help of hand as shown in video. This technique helps bhakri to puff up nicely. Here, healthy, puffy Bajra Bhakri is ready to serve. It goes well with any curry. Enjoy!!! Complete recipe contains - 378 calories. Per serving contains 94.5 calories, along with carbohydrates - 18.25 g, fats - 1.05 g, proteins - 2.75 g.
Since the recommended dietary allowance for carbs is 130 grams daily, you’ll gain 18 percent of your daily intake. The carbs consist almost entirely of starches, which are slowly digested complex carbs. You’ll also get 6 percent of the daily value for protein based on consuming 2,000 calories daily. Heart - It has ability to protect heart health. Millet is a rich source of magnesium, which is an important mineral for reducing blood pressure and the risk of heart attacks of strokes, particularly in the case of atherosclerosis. Millet is also a great source of potassium, which further keeps blood pressure low by acting as a vasodilator. It helps to protect from diabetes, Magnesium is considered one of the most important minerals for increasing the efficiency of insulin and glucose receptors in the body, thereby preventing this disease. Digestion - as it is fiber-rich foods which helps to improve digestion, millet can help to move gastrointestinal system along and eliminate problems like constipation, excess gas, bloating, and cramping. Helps to lower risk of cancer. It helps to increase energy levels, and improve muscle and nerve health. It is good to eat Bajra Bhakri for lunch and dinner.